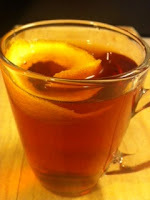 This is the perfect drink for a rainy afternoon or a mellow evening at home. It's comforting and subtly sweet with a hint of orange. Perfect for those who don't necessary like to "taste" their alcohol. Serve hot and with a good book.